It was a great week for larger tuna and one of the best shots and stories of the week. Jared DiFiore (16) and his brother Joseph (14) came to La Paz from New Hampshire with their family hoping to catch "just one fish.. .any kind of a fish!" They had never done this before. 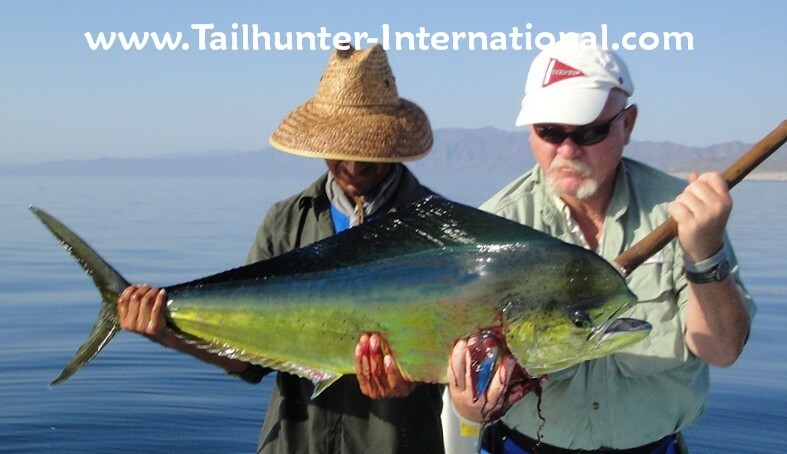 Their first day they fished with our Tailhunter La Paz fleet and got a limit of dorado and were thrilled. The next day, they went snorkeling and ended up swimming with sealions, a whaleshark and saw porpoise a blue whale and sea turles. Then, they decided to try the big tuna at Las Arenas. They figured they were finally up to going to the big leagues. They tied into this big ahi yellowfin tuna and tag-teamed it for almost 2 hours before getting it to the boat. That was it! No more. They asked the captain to take them back to the beach with big smiles! 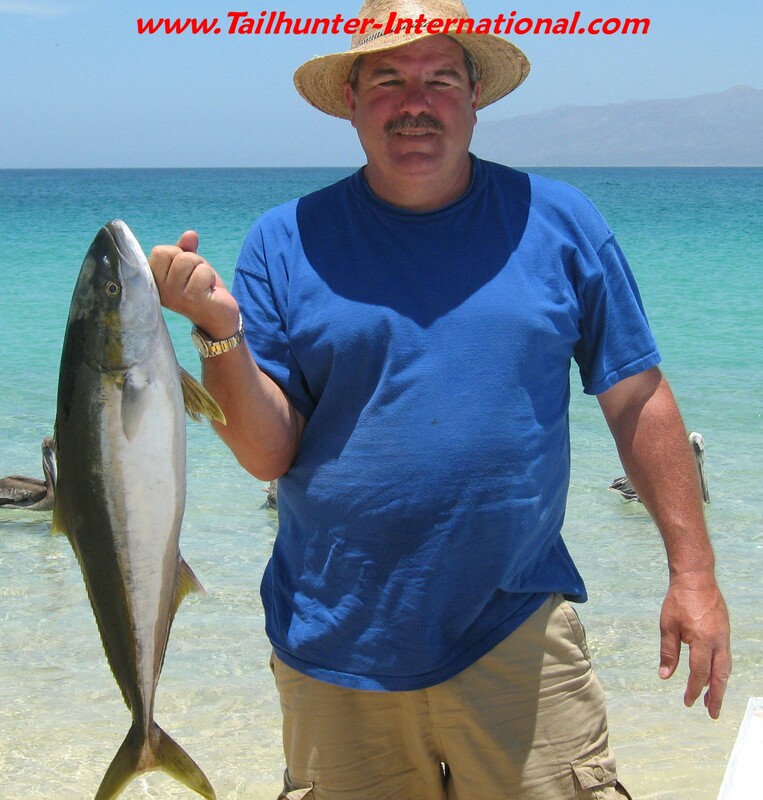 Happy boy "Modelo" Dave Pollard from Upland CA holds up a fat yellowfin tuna he caught with our Tailhunter Las Arenas fleet. Dave "grand slammed"...actually he did better than that nailing tuna, dorado, marlin and pargo all on the same day. A graduation present for 17 year-old Mike Harkins who also works as a deckhand on a Los Angeles sportboat. He's been fishing with us since he was about 2 feet high and always had a knack for big fish. 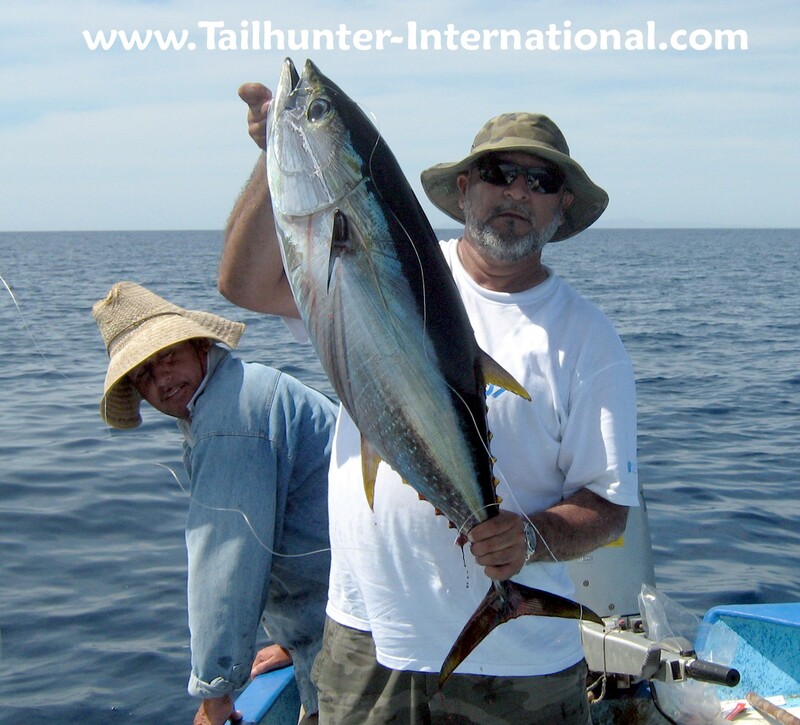 Over 4 days, he got yellowfin tuna, yellowtail, dorado and this big pargo and several others fishing with his dad and using live bait with our Tailhunter Las Arenas fleet. It's been a surprsing few weeks with cold water fish like pargo and yellowtail still around. A long way to the ocean from New Mexico, but Steve Hanson (who invented the "Steve-O-rita" while he was here...Red Bull and silver tequila!) fished with his son, Darren, (holding the tail) and our Tailhunter La Paz fleet and got this blue marlin estimated at 300 pounds. The meat was donated. They also got limits of dorado. It was a good week for both species. 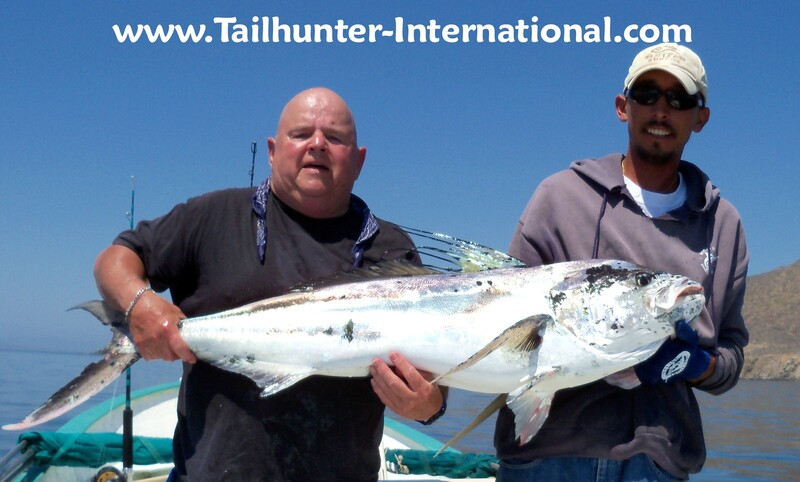 Dave and Mike Van Velzer had a spectacular week after fishing 4 days with both of our Tailhunter fleets. They got a variety of dorado and some of the big yellowfin tuna like the ones they are holding here at Punta Arenas Beach. It was a good week for the youngsters! Steve Kechichian is 16-years-old and pulled on numerous big tuna and dorado like this one he caught with Captain Victor. His best stories from Steve and his dad were the numerous multi-hookups they had and couldn't stop the fish or the fish going in two different directions and unable to chase them down. Recently retired Greg Covello (left) knew exactly what he wanted to do with his free time...catch a big pargo so he came down with amigo, Alex Bastedo. They lost alot of fish ,but did manage to pull these two trophy pargo lisos out of the rocks. It was a pretty good week for marlin! Captain Pancho helps our amigo, Tony Adamich with this nice striper caught near Cerralvo Island. Tony released the fish that day. 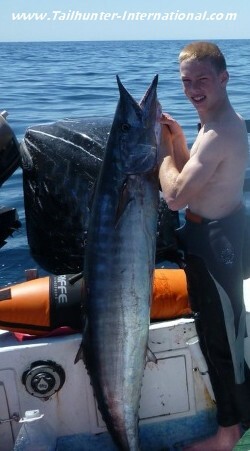 After you fight a big tuna for almost 2 hours, it's not so easy to lift it up when someone wants to take your picture! Mike McCort from New York did his best and we got the photo. These fish showed a big preference for big chunks of fresh squid for bait on huge 7/0 to 9/0 hooks! This is just one more example of our screwy season! 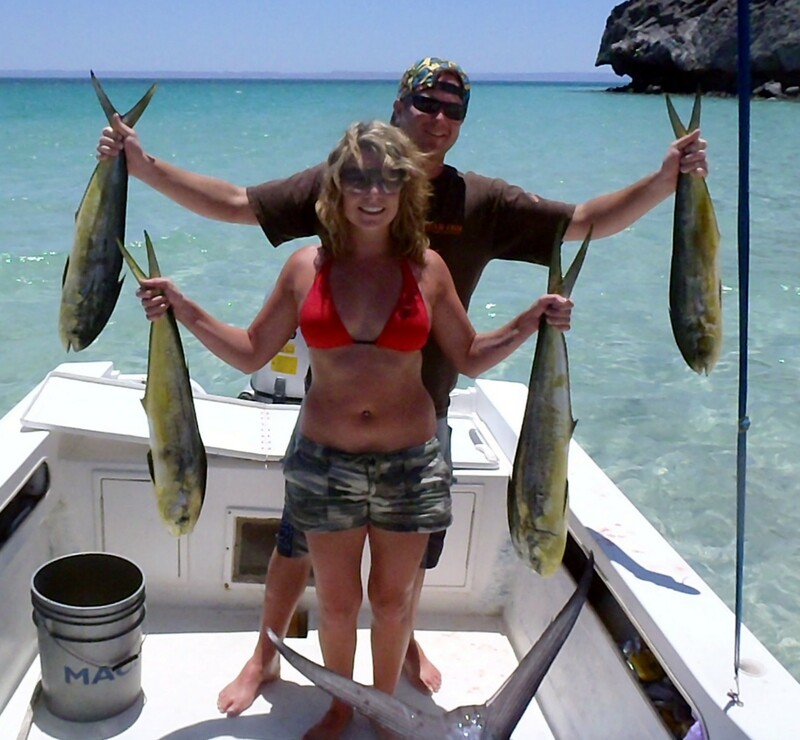 Normally, we see yellowtail in the cooler months and cooler waters of February to May. But it's JULY!! Alex Bastedo holds up a 10 pounder, but we got some in the 30-40 pound class this week that surprised everyone! 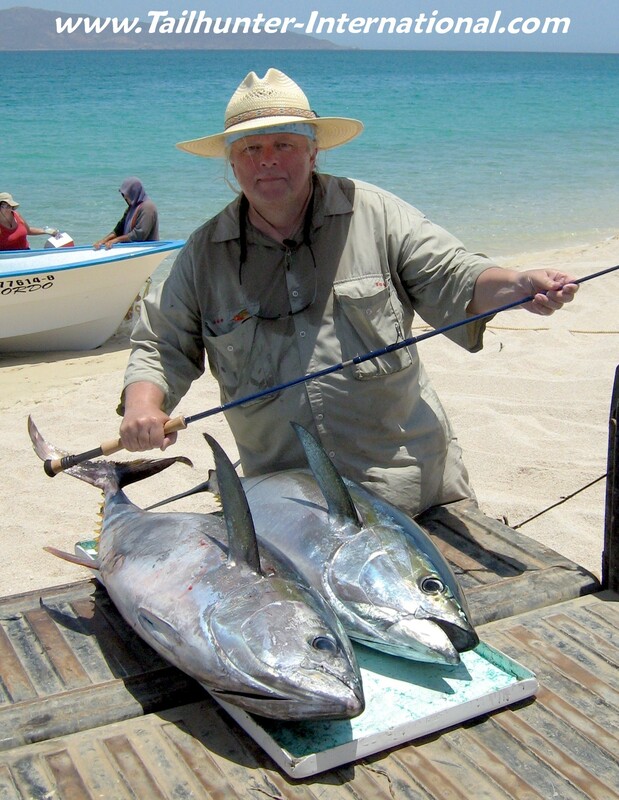 He really wanted to try to get a tuna on a flyrod, but Professor Mark Marcus from Knoxville, Tenn., put down the flyrod when he saw the sizes of the yellowfin tuna that showed up this week. Varton Bagdasaryan is a professional chef in the Riverside area of California and was on his first trip to fish in La Paz waters. His first two fish of the day were a striped marlin and this big tuna. He immediately went back to the hotel and mixed up some sashime! This fish bit a big chunk of fresh squid off Las Arenas. 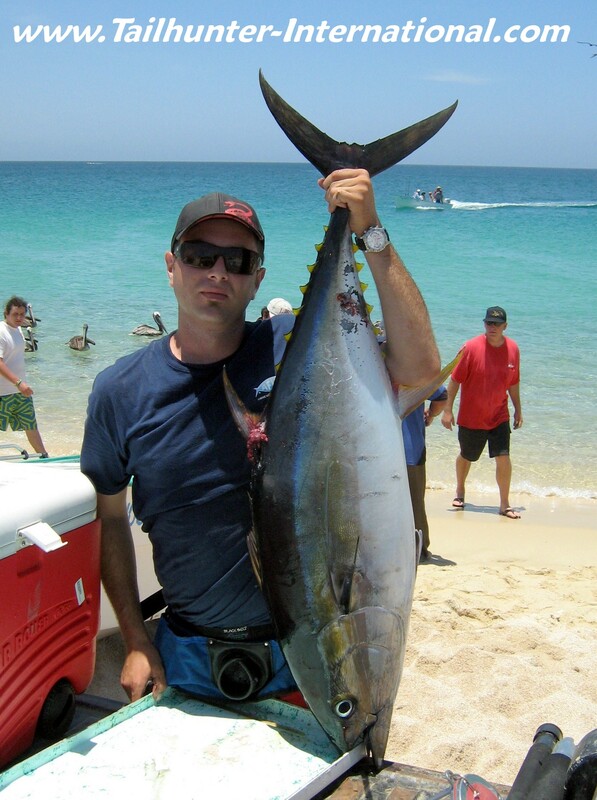 He came all the way from Florida and ended up tangling with one of our big tuna this week. Professor Llew Williams has been fishing with us for many many years and it's always great to have him down. 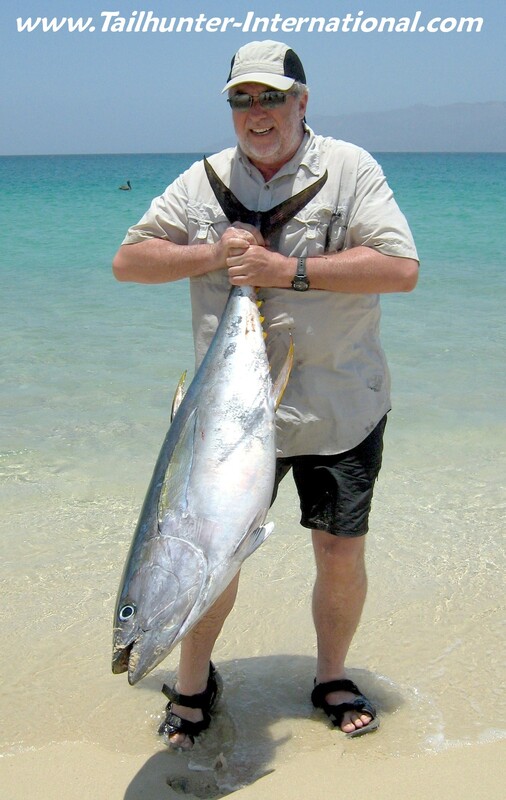 BIG TUNA GIANT SQUID HUNGRY DORADO PACE THE WEEK OF FISHING! Nothing else to describe it other than a solid week of fishing. Some really incredible fishing for some of our anglers who hit some monster fish and literally filled their coolers their first day then after it was gravy! Seriously…especially for our Las Arenas fleet, big tuna showed up in the 40-80 pound class that bent anglers for 1-2 hours each. If you looked at the scores, some days, it might look like we didn’t do that well on the tuna, but if you talked to the anglers, they’ll tell you they fought and LOST 2, 3 or more fish and only got 1 to the boat. Totally spent and thrashed anglers and captains came back with stories of fish fought for as much as 3 hours and losing them and some speculation that some of the larger gorilla tuna were in the 100-200 pound class. On several occasions, anglers fought a single fish for an hour or two and then told the captain, “No mas, take me back to the beach!” They came back and just sat and collapsed. And it was still morning! No way to know if the tuna will hang out, but the key seems to be the giant squid in the morning. If the squid show up and the anglers can put some in the boat, these giant squid are as big as 60 pounds and a true workout right off the bat to grind them up from the deep. “The bite at times was almost instant!” said another of our anglers. “Literally, within seconds of drifting that chunk down, it was like a car came by and suddenly latched on! I’ve never had line spin off my reel so fast. Then it was like I was holding a refrigerator over the side of a building or something! I immediately started wishing these were smaller tuna!” He lost 5 fish before he boated his first tuna but ended up with 3 fish over 2 days with the smallest being 65 pounds. We also got yellowtail! These are fish that are COLD water fish and we generally catch them only in February to May. 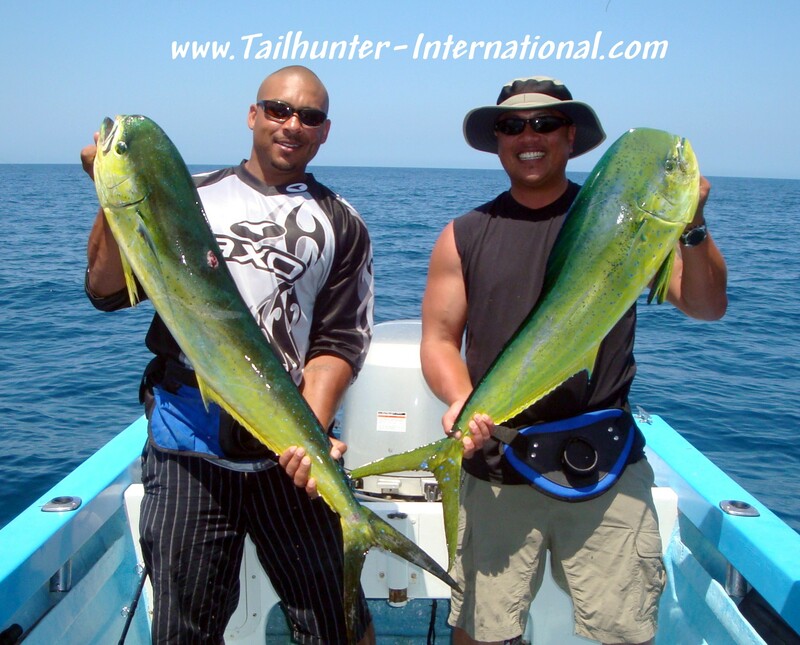 Several of our fishermen got into 10-40 pound mossback yellowtail! Go figure. For our La Paz fleet, they were hanging fish all week as well. With great weather, the dorado came to play. 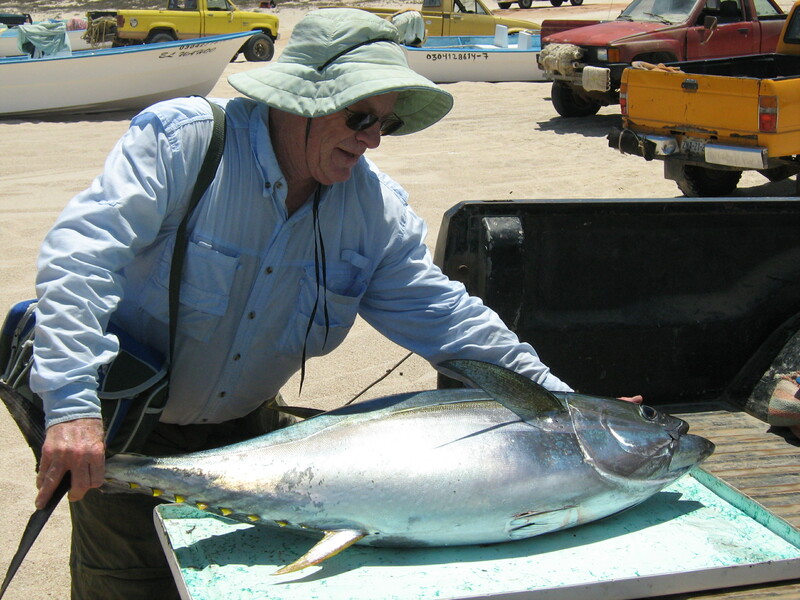 Most days, the boats got limits or near limits of dorado up to about 30 pounds with most fish in the 10-20 pound class. As well, several boats got into nice marlin including one 300 pound blue landed by Steve Hanson of New Mexico. It’s been a screwy year, but this has certainly been one of the better weeks of the season! On and off throughout the week, flurries of 40-60 pound tuna showed up for our Tailhunter Las Arenas fleet which made things pretty exciting. Some bigger fish were hooked and lost too. Fish were just off the rocks at Punta Perrico and eating live bait as well as chunked squid. Dr. Desmond Sjaufoekloy from Orange Co. California plugged the boat two straight days with 8 nice fish as well as dorado and marlin! 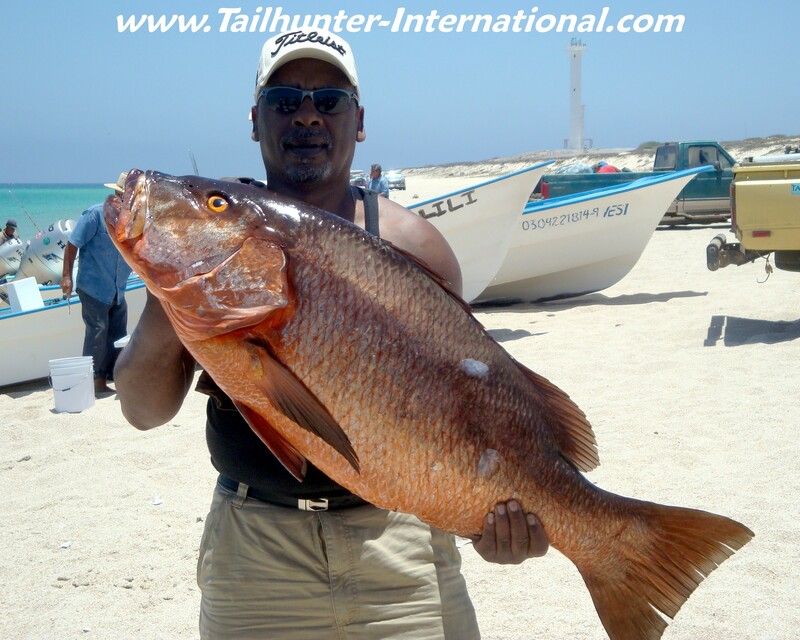 Several big pargo were caught this week. Ray Laney, Sr. was a little upset when his son, Ray, Jr. got the first marlin of the trip, but dad more than made up for it with this huge dog tooth cubera snapper (pargo perro) he got off the rocks with our Tailhunter Las Arenas fleet. Washington resident Ed Van der Veer fished with Captain Pancho and got one of the nicer female dorado which came on strong this week. 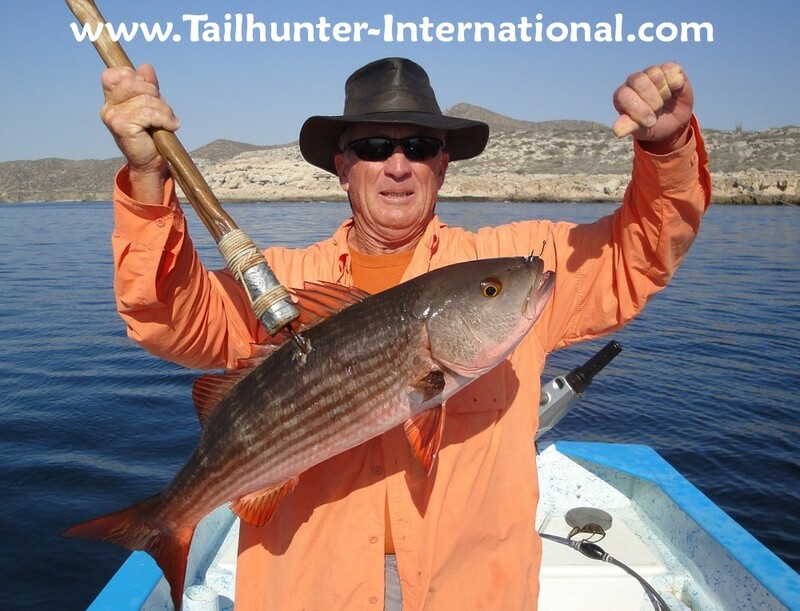 Ed was fishing live bait and light tackle which made it even more fun on the panga. Like I mentioned above, it was a week with some especially good-looking pargo on the beach. Our good amigo, Mark Martis, always seems to do well. Although fishing wasn't particularly good on this particular day, Mark still nailed this trophy pargo liso (mullet snapper ) fishing with our Captain Archangel. Two great looking dorado fully lit! 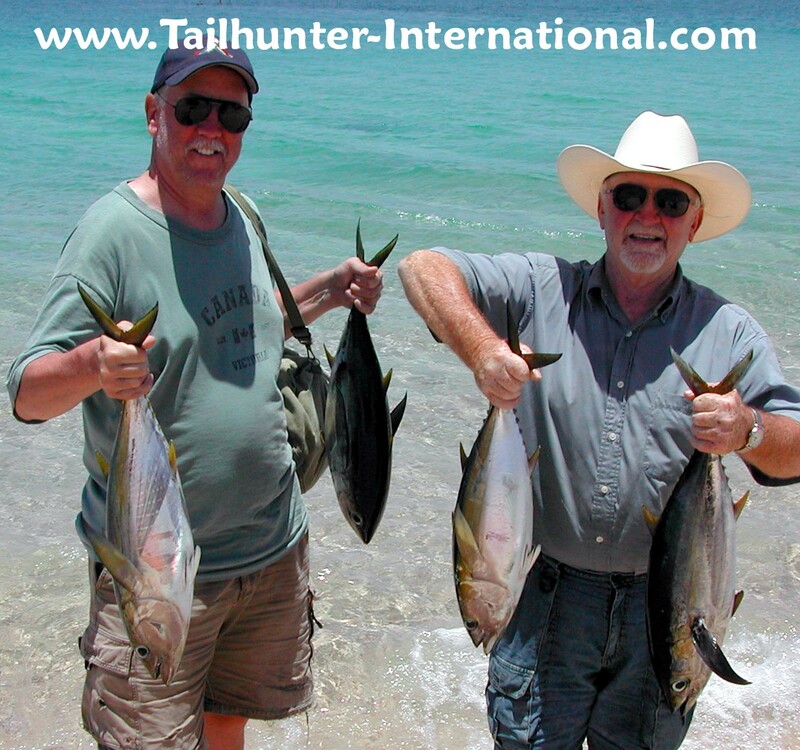 Ray Laney, Jr. and Ray, Sr. hold up a pair that they got fishing with our Tailhunter La Paz fleet where dorado have been the mainstay of the catch with more of the larger fish finally starting to show up. I don't usually post up marlin photos here in the fishing report, but I just had to pop this photo of one of our best amigos, Dave Berthold, holding his first marlin. Dave comes all the way from New Jersey ever single year. He gets the prize for determination plus being a helluva good guy. He has come 12 straight years in a row sometimes fishing every single day just to catch one single marlin! He has done things like promise the captain as much as 500 tip and one year even brought down a new XBox 360 plus games as part of the bonus for the captain if he could just catch one single marlin. Well, this year, he finally got his marlin fishing with Captain Chito and donated the fish. Yes! The big squid are back! Plus this is just a great morning shot too! The squid are not here every day, but when they are, the tuna are lurking nearby as well. 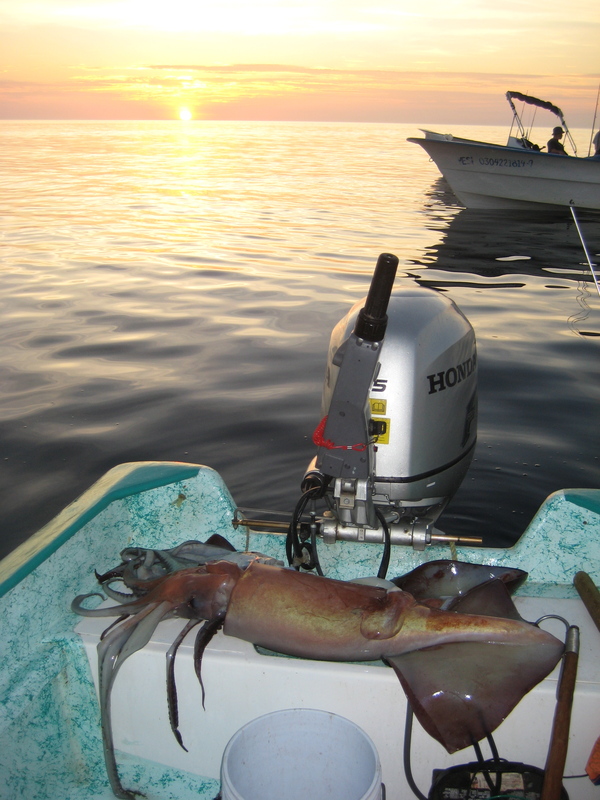 The squid are as big as 60 pounders and are mean and voracious! We are using chunks of the squid for the larger tuna. Coral and Brad spent a week with us all the way from Durango, Colorado and fished a day with our Tailhunter La Paz Fleet and Captain Chito. Holding up 4 of their dorado inside Balandra Bay they had a nice day. If you look at the bottom of the photo you'll se a big tail. 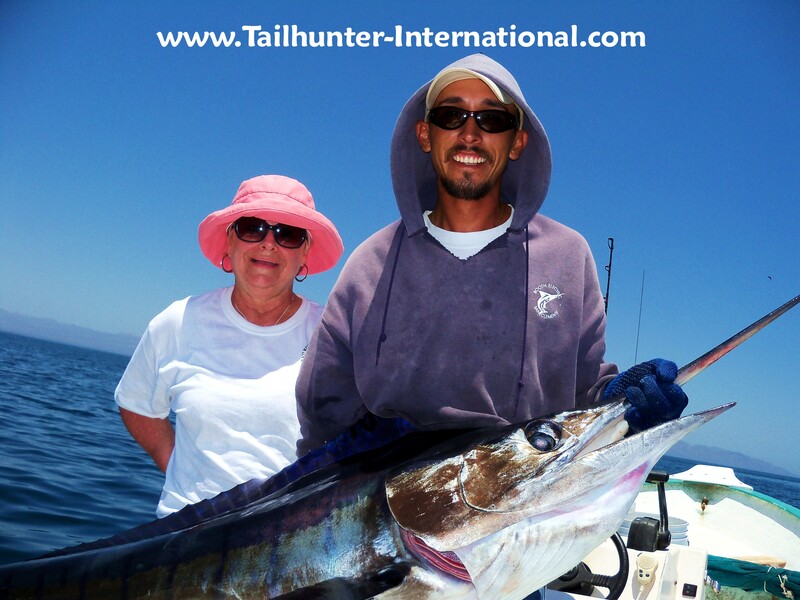 Coral spent 90 minutes on a striped marlin as well! Not bad for 14 years old! Possible world record shot right-off-the-bat! See the story below! 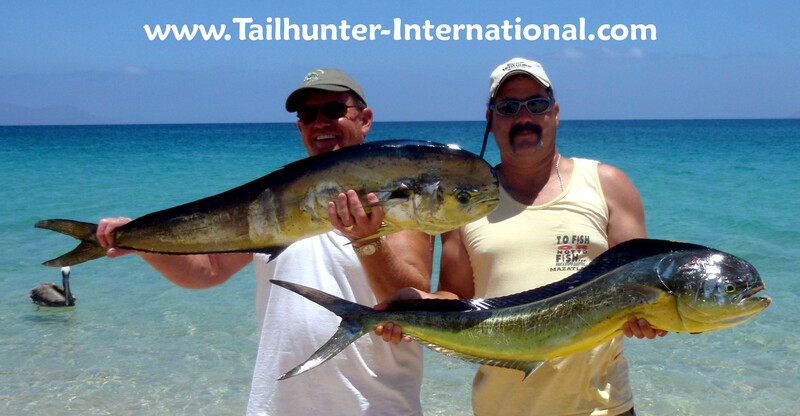 TUNA AND DORADO HIGHLIGHT ANOTHER CRAZY WEEK OF FISHING! A mixed week of fishing here…again! Still having trouble getting a handle on the fishing conditions here as wind blow one day, but not the next. Waters are blue one day, but green the next. Tuna pop up one day then disappear the next. 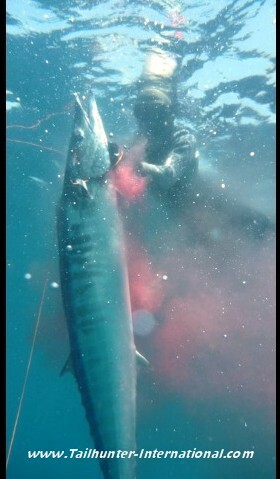 Dorado go crazy one day then the next day it’s giant squid that pop up! One day we can find sardines for bait and the next day they are hiding or have to use squid or caballitos. Never two identical days in a row! It’s a three-wing circus! 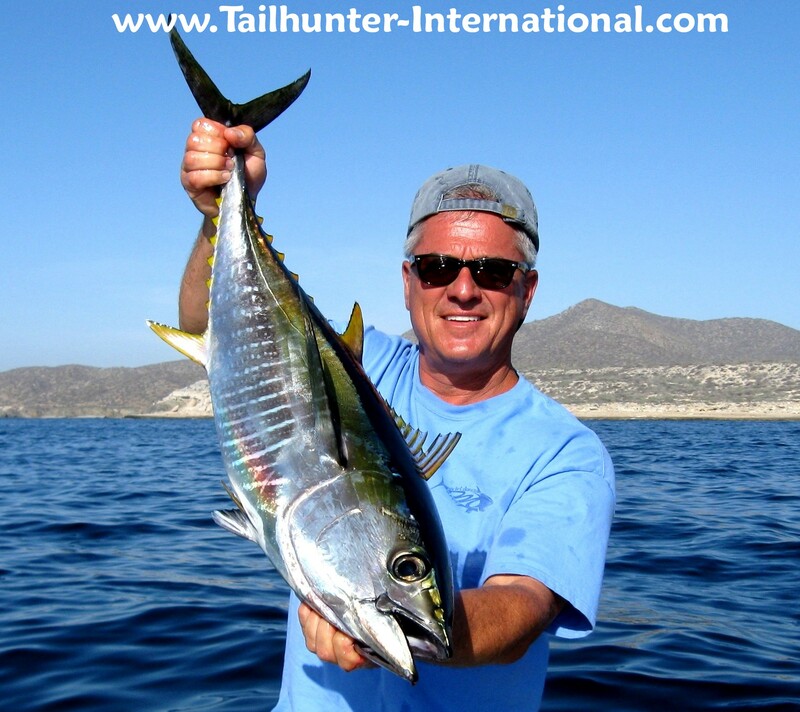 The good thing is that most of our clients are fishing several days and the fact that we have both our La Paz and our Las Arenas fleets allows us to adjust where our clients fish as dictated by the weather, fishing conditions, bait, and what’s biting. 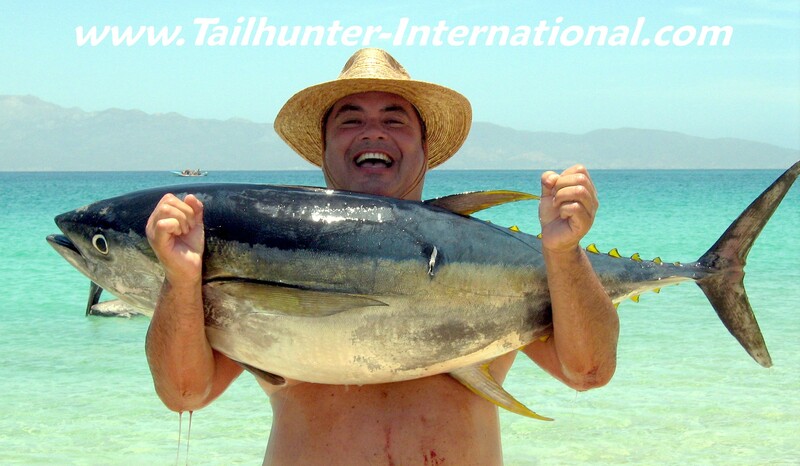 For our Las Arenas anglers the up and down appearance of yellowfin tuna has been the most exciting part of the week. The fish aren’t there everyday, but it seems that when the giant squid are around, so are the tuna. But even with the tuna, their appearance is as erratic as their size. One day, it’s all 5-10 pound footballs. The next day, it seems like they gulped steroids and they’re 40-100 pound monsters that beat up everyone! The 40-50 pounders are manageable…maybe 10-30 minute fights. The larger fish…well, no one has landed any of the 100 pounders yet. Once the battle goes towards and hour-or-more, it seems that the battle leans more in favor of the fish as the anglers and the gear wear down in the hot sun. One mistake and it’s zingpowie…bye bye tuna! Fortunately, for both our La Paz and Las Arenas fleets, other species like dorado, marlin and pargo, cabrilla and roosterfish fill in the gaps most days. 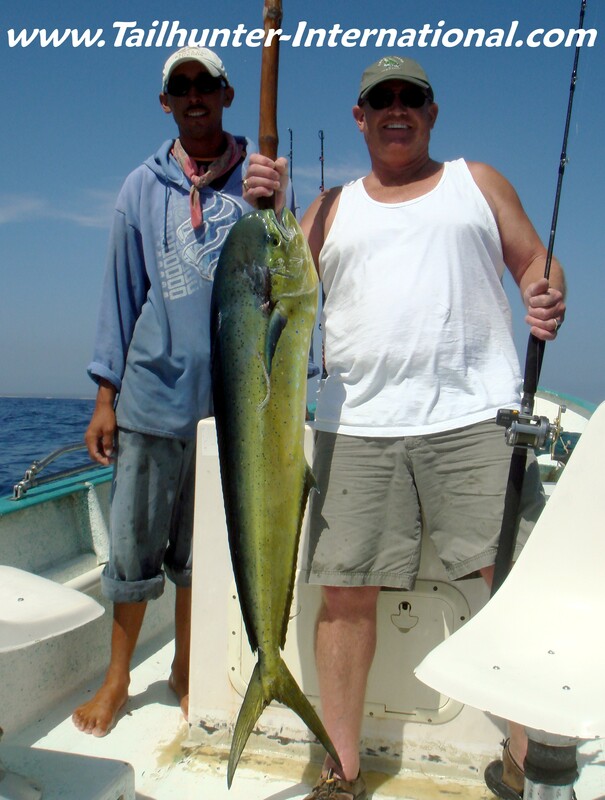 The dorado are the most prolific and finally we’re at least seeing some larger fish in the 20-40 pound class. Slow trolling or drifting live sardines, caballitos or strips of fresh bonito are key. If you’re coming down, bring big squid jigs just-in-case the squid are here. They are 20-80 pound beasts! Also bring an assortment of live bait hooks to accommodate the different types of bait that might be used. 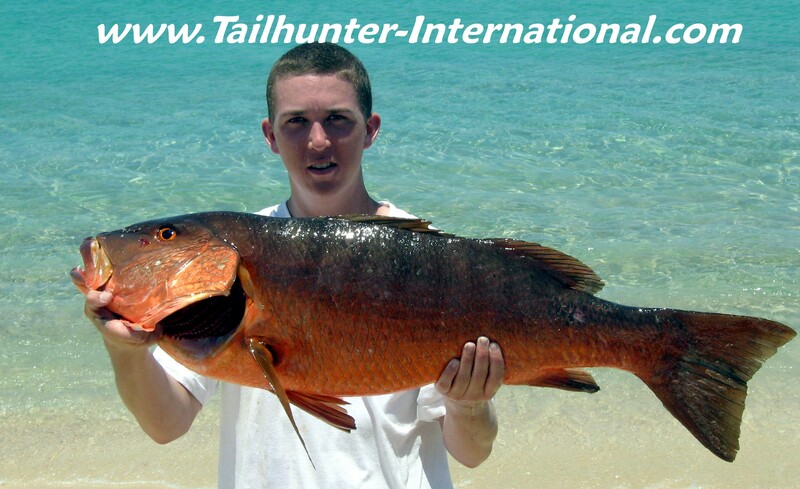 FIRST PERSON STORY FROM A 14-YEAR-OLD SPEARFISHERMAN WITH PENDING WORLD RECORD! “Right after the La Paz Blue Water Invitational Championships, my father, John, Dennis Haussler, three time national Spearfishing champion and I went diving on the north end of Cerralvo. I was using a prototype Sea Sniper, 2 bander. We were flashing and got into the wahoo, my father shot and lost one after being pulled around, and then landed a 60 pounder, Dennis shot and landed a 70 pounder with ease. Dennis beckoned me into the water, we threw flashers for 5 minutes. VOLARIS AIRLINES SURPRISE LA PAZ AIRLINE TICKET SALE! We just found out of a big sale that Volaris Airlines is having. Round trip to La Paz from Tijuana is only about $120 bucks! They will pick you up in San Diego and bring you right to their terminal. Lots of our clients have been using this brand new airlines for the last two years and service has been great. You MUST purchase tickets by July 20 and travel must be between Sept. 1 and Dec. 12th. 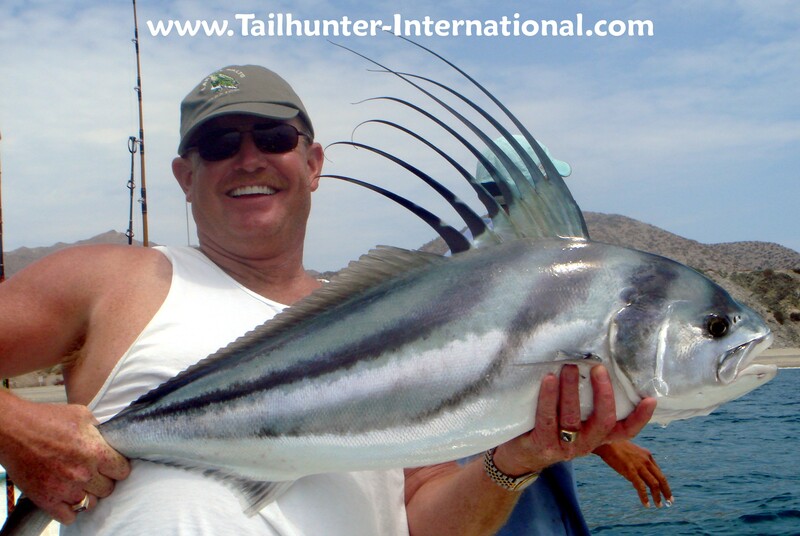 First timer, Ed Vander Veer from Washington state was doing some light line fishing with our Tailhunter Las Arenas Fleet and got a number of roosters over several days of fishing releasing them all including this nice pez gallo. One of the larger dorado of the week! Christine Rinaldi came to see us again all the way from New Jersey and spent more than a week fishing with us and took this nice bull not far off the Las Arenas lighthouse. 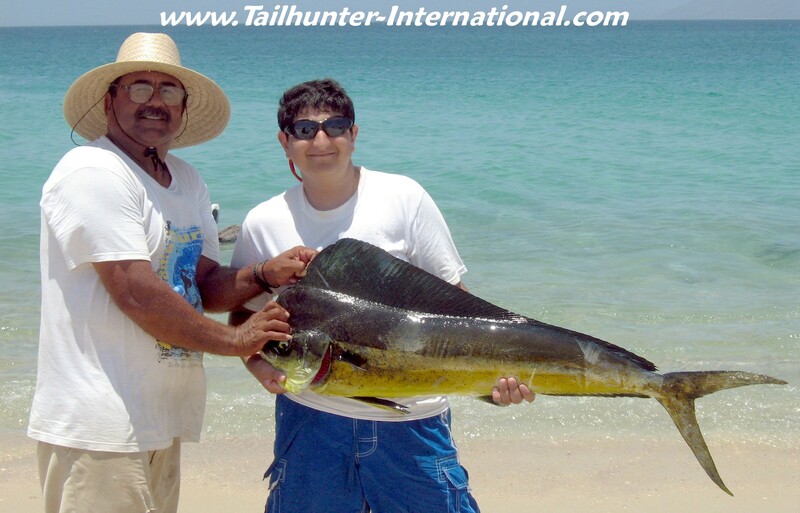 It was an up-and-down week for dorado fishing with fish sometimes hungry and other times completely ignoring baits. Earlier in the week, there was a fairly nice dorado bite with our Las Arenas fleet that got chillier when colder waters moved in, but our Arizona amigo Mike Guest did put this female in the box! There was some good sporadic tuna fishing throughout the week although anglers really had to work hard to find the fish which popped up in varios places around Cerralvo Island, but were often elusive. Mary Heilman shows off one football yellowfin on the gaff fishing with Captain Pancho using live sardines. Now THIS is a roosterfish...the kind that made Las Arenas famous! Dave Wehner really wanted to catch a rooster on light tackle. He had no idea, that a 60-pound class fish would inhale his little sardine while he was using 15 pound test and a little bass casting stick! Dave fought this fish for 90 minutes before getting it aboard for a quick photo and releasing it. Despite what it looks like, Dave said the fish swam away strongly! Once a year, Kansas hunting guide, Don Snyder on the right gets to put on shorts and flip flops (although he gets to keep his cowboy hat) and comes to hang out with us in La Paz. He brought his buddy, Tom Carey from Colorado. (Tom...you dance great!). They're holding up some of their yellowfun tuna catch here standing at Las Arenas beach. Everything is good when the fish are biting. Mike Whitlow (on the right) fishes professional bass tournaments and came down with his bud, Ed Vander Veer and did alot of light tackle fishing. Sometimes they really had to work hard to get the fish to bite during a week when fish were sometimes less than cooperative, but here, they hold up two nice dorado they picked up off Las Arenas. 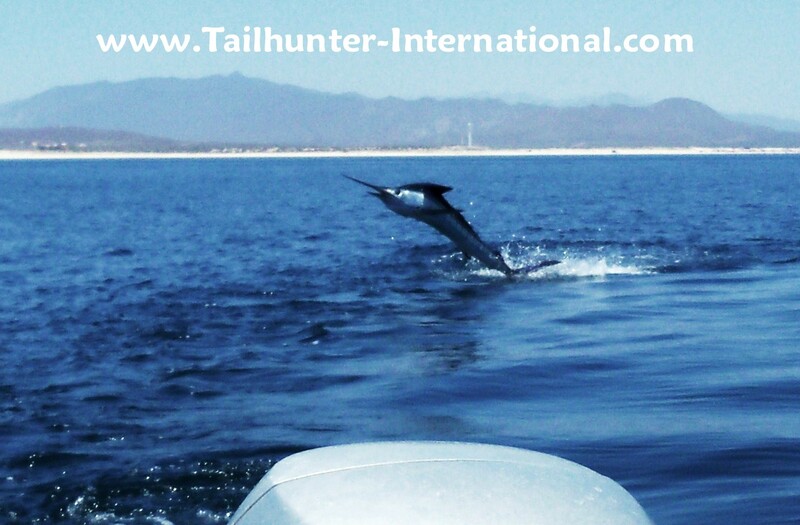 Marlin jumping off the stern of a panga (see the photo below for the story)! A blue marlin first for Mary Wehner looking none-the-worse for wear and tear as she's assisted by Captain Pancho with a blue estimated at 150 pounds. That's the fish in the picture above leaping off the stern! Mary hooked this fish just after her husband fought the big rooster two photos above. Bravo to Mary, she released the fish unharmed! One of the best guys for posing with a fish, San Diego resident Mitch Chavira always gets fish whenever he comes down several times a year. He's hoisting a nice yellowfin tuna still lit up. A mixed week here for fishing. Weather and fishing were both as mercurial as the air temperature at times as the wacky unpredictable fishing season continued. The upside is that most of our folks who fished a few days all ended up with somes good fishing, but in between several good days, a really puzzling bad day could be had just as easily. One day, the dorado or the tuna are jumping out’ve the waters and into the boat. Marlin are all over. The next day, that same panga in the same area doing the exact same thing would have a problem even getting a bonito or a needlefish to rise to a bait. Similarly, beautiful blue sunny waters one day would turn to windy chop the next and all of us would be shivering in sweatshirts and windbreakers. Go figure. Overall, it wasn’t the best of weeks. Everyone had fish by the end, but some days it was like pulling teeth. It’s been a strange season and we seem to be about a month behind where we should be. As well, bait continued to be an issue some days. One day it’s easily found. The next day, it would take hours. However, like I said, if you fished at least a few days, the end result was a pretty nice stack of fish fillets! You just had to weather the slow periods. 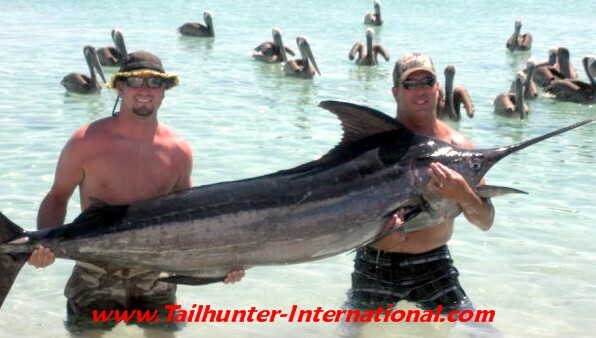 Hats off to our angler who were here this past week. Even during the tough times, they kept laughing and working it and in most cases it paid off. 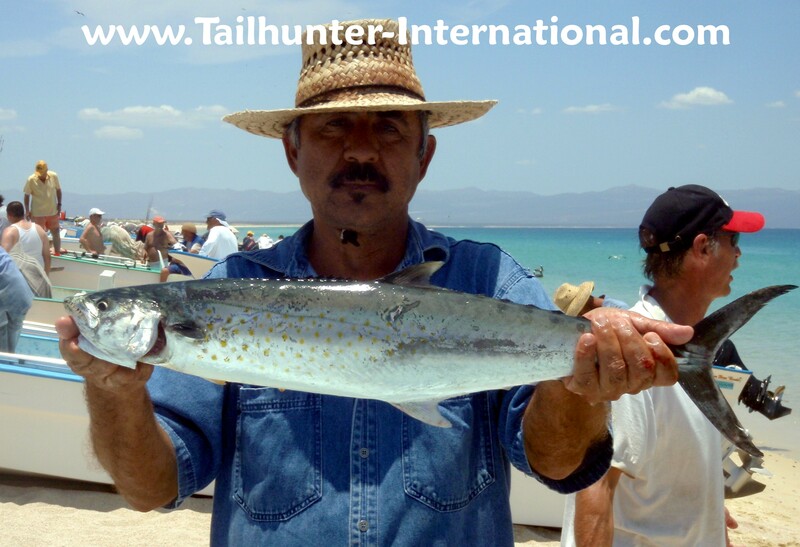 For our La Paz Tailhunter fleet, dorado were mostly in the spotlight with fish being found in several area, most notably around Punta Mejia and the Las Cruces areas between Cerralvo Island and the Peninsula. Most fish were in the 10-20 pound class. We’re still seeing quite a few marlin as well. Almost all of them have been stripers in the 100-130 pound category. There were also some good spots of pargo, cabrill and amberjack. For our Tailhunter Las Arenas fleet, lots of variety continued. Spots of tuna seemed to follow the big squid up from the trenches. (The squid have been as large as 60 pounders!). 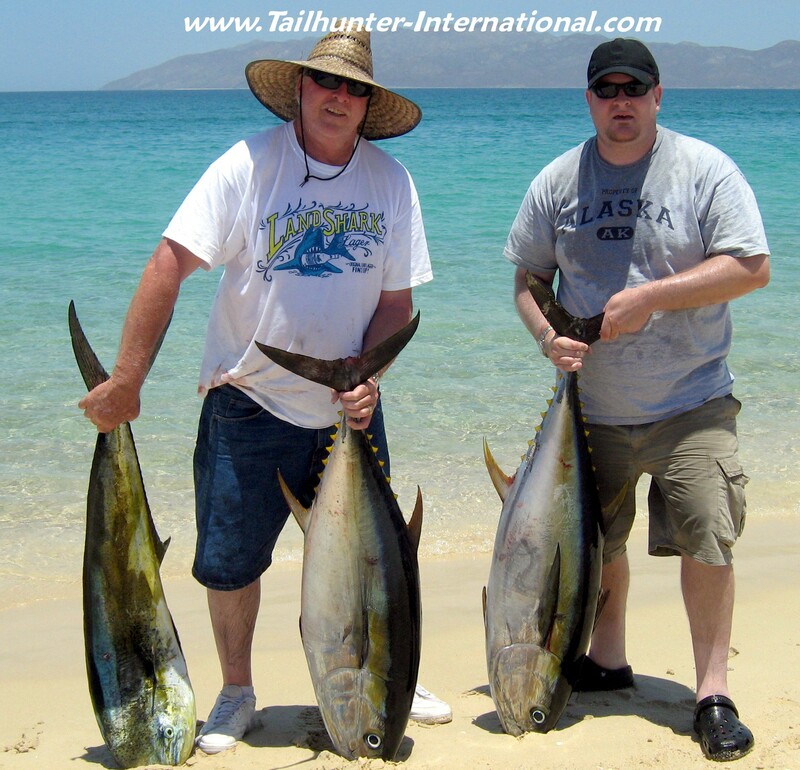 Tuna have likewise been as big as 60-100 pounders with several large ones hooked and lost. Our largest this week that made it into the panga was about 60 pounds. Most, however were football tuna in the 5-15 pound class and they really seemed to like eating chunks of dead squid (not surprisingly) or else the really really pin-head sized sardines. For other species around Las Arenas, dorado keep breezing through and at least a few boats find the erratic schools with fish up to about 25 pounds. Roosterfish are in a spot near Boca de Alamo south of Muertos Bay and big pargo and cabrilla are still hanging out in the rocks. By the way, if you’d like to get your fishing report fix more often than every week, I post up daily fishing reports often with photos and video clips 4 or 5 times a week if you get on face book and put JONATHAN ROLDAN on as a friend. Also, if you’d like to keep up with the crazy fun at our Tailhunter Restaurant/Bar, get on facebook and become a FAN. Easy to join. 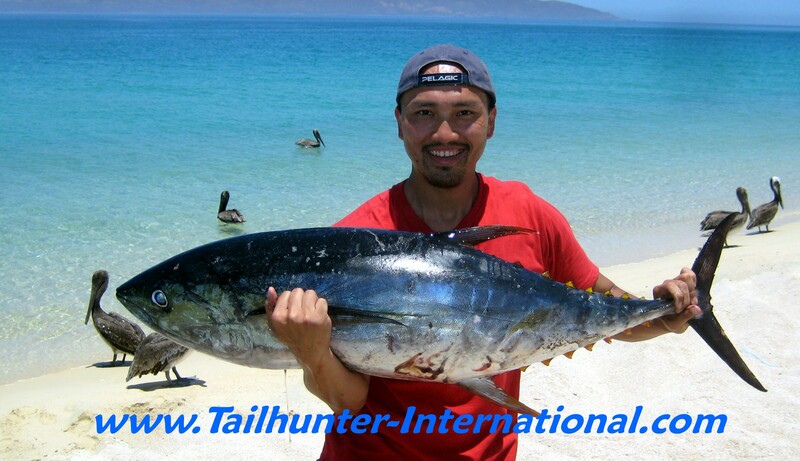 Yellowfin tuna popped up for our Tailhunter Las Arenas fleet with some fish in the 60-200 pound class that really chewed up anglers and spit them out, but some nice "football" sized fish in the 10-30 pound class like this one held by our amigo, Jorge Romero and assisted by Capt. Jaibo, did show up in flashes throughout the week. Looks like big roosterfish season is here. We're not seeing so many smaller fish anymore. Most of the roosters we got this week were like this hog of a fish caught and released by BARBARA KENTSLER from Utah (Sorry for the mistake Barbara and thanks Aubrey for catching my error!) with Capt. Jorge near Las Arenas. There are still a surprising number of pargo around. 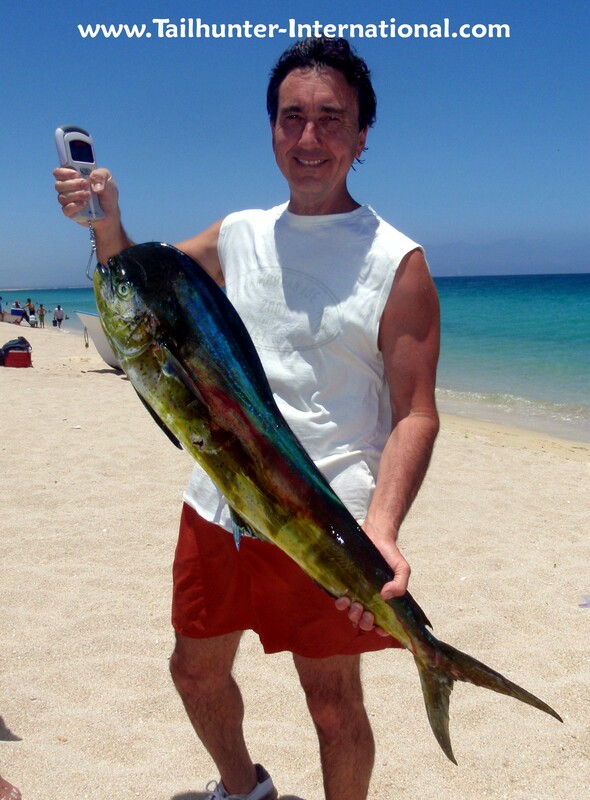 Check out the flat seas behind Randy Forestiere holding this nice pargo liso just off Muertos Bay. I wish our friend, Rich Sawaske, and Capt. Adolfo had looked up into the camera, but they have their eyes riveted on this beautiful dorado Rich got on a live sardine just off Punta Arenas. Check out the flat ocean. They were only a few hundred yards offshore. The water is still cold enough that we're still getting sierra which are normally cold water fish. Captain Romero holds a big one! Great eating fish. MARLIN TUNA DORADO WAKE UP TO START SUMMER! It was all going along really well. Then the winds came up again…at least for our La Paz fleet. It was like April all over again as the week came to a close, but before that, fishing had been really great. However, that’s what I heard more than once this past week, especially for our anglers fishing with our Las Arenas fleet. Over the last two weeks, all those lazy striped marlin and sailfish that have been sunning themselves on the surface waiting for the waters to warm finally woke up and came to the party. It’s about time! Fortunately, most of the marlin are getting broken off or released, and it’s especially great to see so many first timers letting their fish go…especially the youngsters tying into their first billfish. However, in addition to the billfish, we got quite a variety of other species, especially around the south end of Cerralvo Island and Las Arenas. More and larger dorado showed up although there’s still quite a few dinks, but we saw some fish caught in the 20-25 pound category. 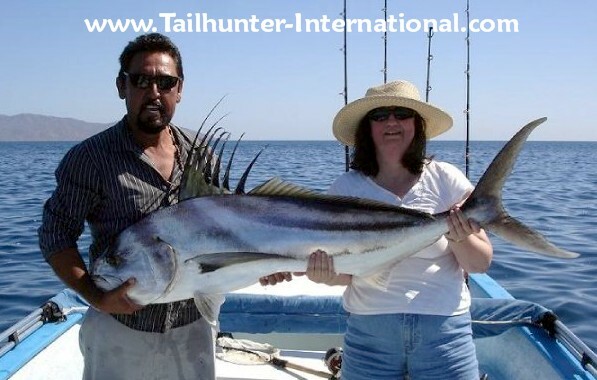 As well, we’re not seeing as many roosterfish, but some really hefty big boys were caught and released up to about the 60-70 pound category as well as pargo and cabrilla. More exciting than that, however, was that some large squid popped up south of Arenas and usually when that happens there’s tuna that come up out’ve the deep trench. Sure enough, we got into some 20-60 pound fish and several larger tuna in the 100+ pound category were hooked and lost after long long battles. 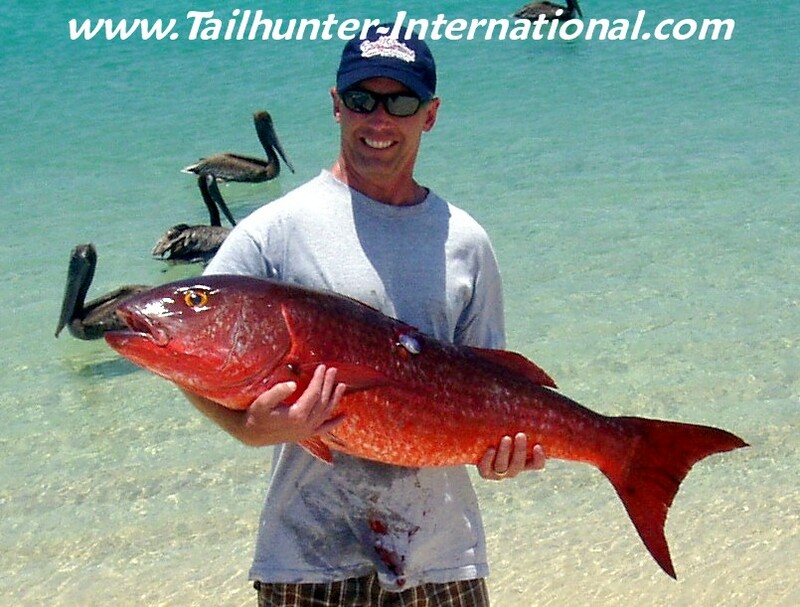 There were even some fish estimated at 200 pounds that literally gobbled up anglers and spit them out. There weren’t alot of tuna, but enough to get everyone excited and to see some of the larger fish pop up as well really jacked up the interest. 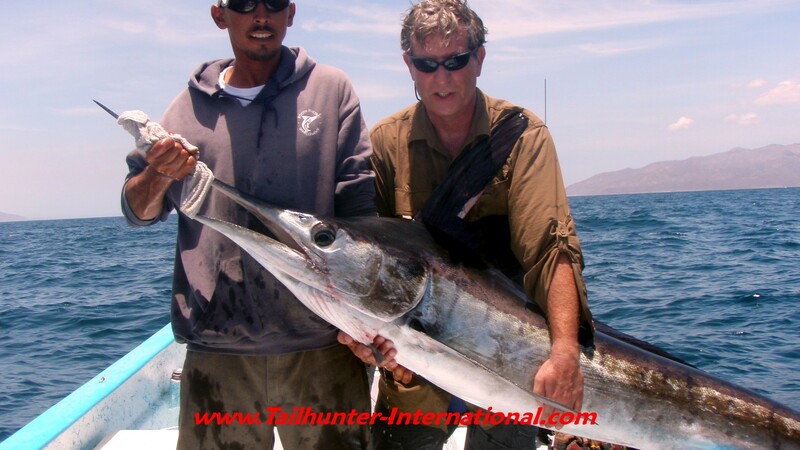 Only problem was that many anglers were outgunned or not experienced enough to tackle these bigger gorilla tuna or, in some cases, I heard of at least 2 anglers simply cutting themselves off when they realized what they were tied onto! If you can, imagine holding a 200 pound weight over the side of a 50-story building in a strong wind and you’re attached to that weight with a little tiny piece of string and a rod and reel! How many hours can you hold that? Will keep an eye out. Have a great 4th of July holiday!